I’ve gotten on a “breakfast for dinner” kick. It’s super easy, inexpensive, and lets you enjoy some breakfast-y things that you would not normally have time to make during the week at breakfast time. You see, I’m not a morning person. Never have been. And so, my kids suffer at breakfast because I’m struggling most mornings to be vertical and coherent for them. Cooking fantastical breakfasts is just not going to happen. But cooking an awesome “breakfast” for dinner? Totally do-able. I’m awake at 5PM, just not so much at 5AM. So, we’ve been making breakfast for dinner the past few weeks… It’s sort of become our Thursday night dinner tradition since the kids aren’t wild about leftovers and Thursdays are a busy day with dance classes, etc. And so this week I went looking for new recipes to try. What I found was that there are not too many variations – eggs, flour, sugar, etc. What did differ was whether the egg whites were whipped or not. The first recipe we had tried did not have the whipped egg whites and the waffles were flat – in taste and volume. I wondered if whipping would make a difference, but, quite honestly, it seemed like a lot of extra work. Was there really a payoff? Then I found a recipe on Food Network’s website for “Waffles of Insane Greatness” which are from Aretha Frankenstein’s restaurant in Tennessee. Right off the bat I was intrigued – the name of the waffles, the name of the restaurant and the fact that it was a southern recipe. Then I saw that you don’t have to whip the egg whites. Score!! 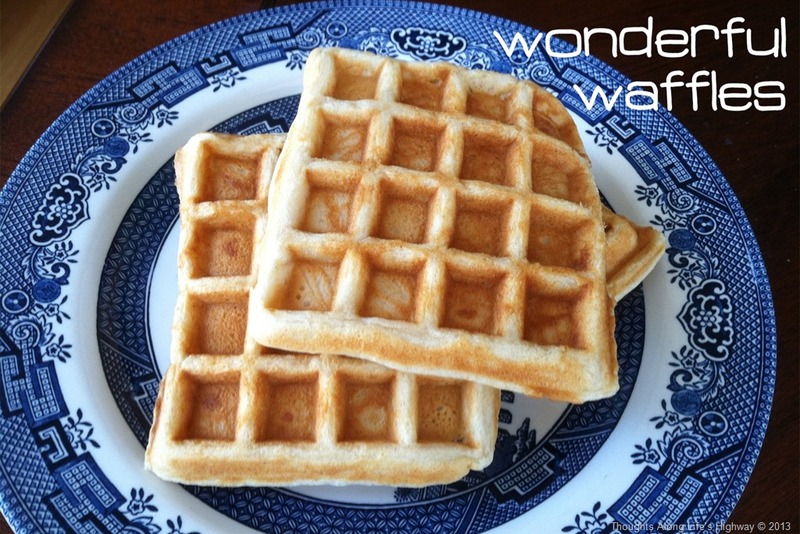 I had also found this recipe for the Very Best Waffles (they claimed) – I printed it out and compared to the Insane waffle recipe. Pretty much the same with the exception of the addition of some spices. I had one other requirement for my waffles that no recipe included but that was non-negotiable for me. They had to have some added protein. I couldn’t handle the carb-fest myself and wanted to be sure the family got a little more protein in their dinner, even if I had to sneak it in. I figured I’d improvise that part. So much so, that, as I’m typing I’m nibbling on one, cold & dry, and yet it’s still good. 1. In a mixing bowl, combine the dry ingredients. 2. If using, add the cinnamon & nutmeg to the dry ingredients. 3. In a measuring cup, combine the buttermilk, oil, extracts and egg. Combine gently. 4. Pour liquid ingredients into the dry ingredients and use a whisk to combine. 5. Let the batter sit for 5-10 minutes while your waffle iron heats. 6. Spray your iron with nonstick cooking spray and ladle some batter onto the iron. Bake them as per the instructions for your iron. 7. Serve immediately or keep warm in preheated oven until ready to serve. – I doubled the recipe and got 10 waffles. Depending on how many people you’re feeding you may need to double as well. – I think next time I will preheat my oven to 200 degrees, as the one recipe suggests, and put the finished waffles on the rack in the oven to stay warm until they’re all finished being made. That way we can sit down and eat together rather than in shifts as I finish up waffles. – The almond extract, nutmeg and cinnamon are completely optional but I put them in and I think it added a great flavor. Big Girl was not crazy about the nutmeg. I may leave it out next time since I’m the only one who is really nuts about nutmeg around here. – I had a few left after we ate dinner and I put those in a ziplock bag in the refrigerator for breakfast the next day. I reheated them in the toaster oven.